This is it. This is the year Adrian Beltre finally declines. Yep, you heard it here first, folks. Adrian Beltre is donezo. I mean, come on — dude’s about to be 36 years old. He’s logged 10,001 plate appearances since he entered the league in 1998, a number topped by only Derek Jeter. His defense has declined significantly the past two seasons, no matter what metric you use. He only hit 19 dingers last year after averaging 32 over the previous four seasons. Clearly, all that wear and tear has taken its toll on Beltre. The jig is up! The fat lady has sung. We don’t know everything about how baseball players age, but we know more than we ever have. We know that hitters generally peak around age 26 and are no longer what they once were by age 32. Beyond that, we know, to some extent, how specific components of a batter’s profile age. Walk rates don’t peak until a batter is in his late 20’s. Strikeout rates peak a bit earlier than the magic 26. And power peaks earlier than anything else, and also has the most dramatic decline. And that makes sense, if you think about it. As a player gets older and his body wears down, is he more likely to lose bat speed and strength, or vision and discipline? Intuitively, we’d expect the former. Welp, that’s it. Stick a fork in him. A 36-year-old third baseman on a bad team with declining defense and the power of Brett Gardner? No thanks. To be fair, Gardner is kind of a sneaky pick, given that his power boost over the last couple years is worthy of an article on its own. I could just as easily have picked Hanley Ramirez or Hunter Pence, who were right in the same spot, but you get the picture. 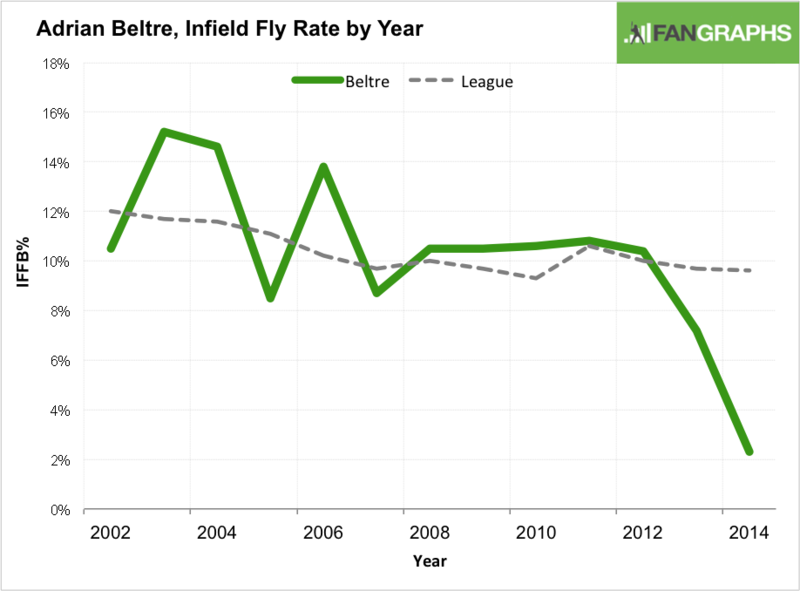 Beltre’s power has declined, and it’s declined significantly. Over the last four seasons, in the power department, Beltre has gone from Giancarlo Stanton to Brett Gardner, all while playing in the hitter-friendly Ballpark in Arlington. I didn’t include player comps this time, but I might as well have just put (Adrian Beltre) four times. Because in terms of overall production, he hasn’t changed one bit. In fact, relative to the league average, he was a more productive hitter in 2014 with Brett Gardner power than he was in 2011 with Giancarlo power. Which brings us to our question: What the hell? How is Adrian Beltre defying Father Time? Age is taking its toll on Beltre’s power. It’s taking its toll on Beltre’s athleticism. It might be taking its toll on Beltre’s health. So why isn’t it taking its toll on his production? We’ve talked about the power, and you can see it right there. A 70-point drop in ISO is a big drop! But so is a 30-point increase in on-base percentage. As Beltre has aged, he’s dealt with his declining power in the best way he can — by just getting on base. Beltre’s walked more often. That’s the easy one. His walk rate last season was the highest its been in 14 years. He’s swinging less than ever, and, specifically, he’s chasing less than ever. Boom. Increased walk rate. It’s that easy! But a 3% increase in walks doesn’t fully explain a 30-point increase in OBP. No, that’s also got to do with what’s happening when Beltre puts the ball in play. I think I’m more of a believer in a hitter’s BABIP being a skill than most. Last week, I wrote about Starling Marte and his quest for the perfect batted ball profile. Marte has been able to sustain an exceptionally high BABIP, and I cited his line drive rate, pop up rate, and speed as reasons why. I found that these three factors alone can explain more than 50% of a players batting average on balls in play. Beltre was never fast, and he’s only getting slower as he ages, but we’ve still got a couple places left to look to potentially explain Beltre’s 30-point boost in BABIP the last two years. Start with the line drive rate, and you see something. Prior to Texas, 19% of Beltre’s batted balls were line drives. Those first two years in Texas, 19% of Beltre’s batted balls were line drives. These most recent two years, 22% of Beltre’s batted balls have been line drives. Line drive rates can be subject to year-to-year fluctuation, but Beltre was one thing throughout his career, and now he’s something different. Couple that with a career-low fly ball rate, and you get the sense of a slightly altered swing. I’m not an expert on swing mechanics, so that’s just a guess, but it would be an understandable change for a guy with declining strength and bat speed — a flatter swing, aimed to spray the ball rather than an uppercut aimed to rely on the long ball. Early in Beltre’s career, he popped up quite a bit. Once he hit his peak, he hovered right around the league average from 2008-12. In 2013, he dropped his infield fly rate by three percentage points, and that was the 17th-biggest improvement among qualified hitters. Then, in 2014, he dropped his infield fly rate another seven percentage points, and that was the 3rd-biggest improvement among qualified hitters. Beltre only hit four infield flies in 614 plate appearances last year. He used to hit upwards of 20 a season. Infield flies are the equivalent of strikeouts, in that they’re essentially a guaranteed out. Not only has Beltre maintained his already-elite strikeout rate over the years, but he’s significantly dropped his “guaranteed out” rate by not popping out anymore. Take those 20 or so missing pop-ups and call them strikeouts, add them to Beltre’s 2014 and you’d get a 3% boost in strikeout rate. That’s something we’d notice. Instead, what used to be pop-ups are now regular balls in play, and as we’ve already discussed, those balls in play are now line drives more often than they’ve ever been before. Line drives are good. Never popping out is good. Walks are good. Adrian Beltre is good. Hitters dingers is good, too, but it’s not the only way to succeed. He’s still an easy candidate for 20+ homers, but this is how Adrian Beltre continues to excel without all the power he once had. This is how Adrian Beltre continues to defy Father Time. We hoped you liked reading How Adrian Beltre Has Defied Father Time by August Fagerstrom! Quit being such a hypocrite, DAD. I did the yardwork last week, I’m not doing it again this week. No, I don’t pay rent. Do you want me to? No, I just want you to appreciate me a little bit, you ungrateful brat! Well, fine, dad. I appreciate you. Happy now? It’s all I’ve ever wanted, son. As thanks, I’ll let you have another 2 seasons of 130+ wRC+. Because you’re my little guy. I’m sorry, dad. I love you. I love you too, son. I love you too. Father, nobody touches my head… NOBODY! I-I’ve killed him. It’s over. It’s finally over! I am now IMMORTAL! Stephen Colbert and I will take over this world!